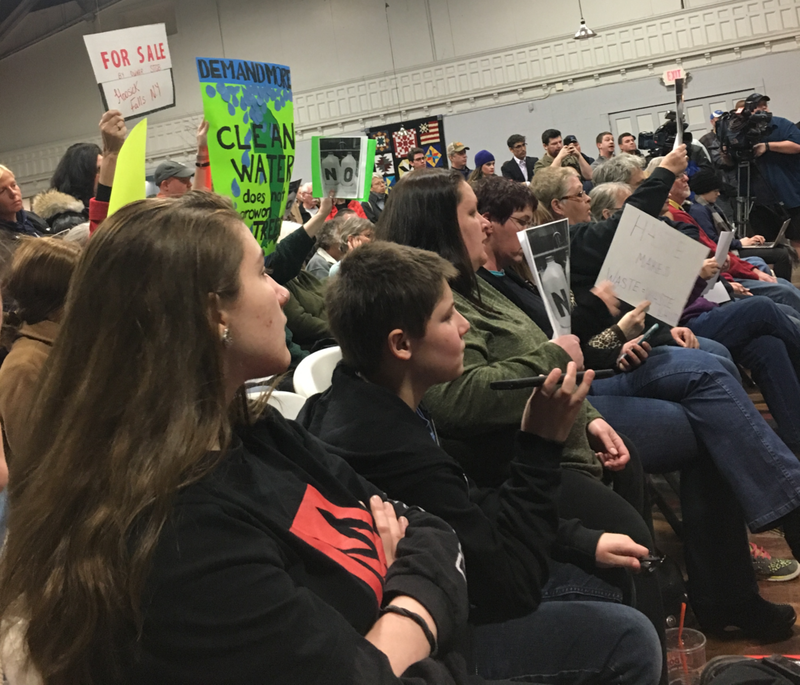 Protesters at a Hoosick Falls Village Board meeting in spring 2017. Photo by Jorja Rose. This is what former EPA Regional Administrator Judith Enck told me when we met to discuss her work this past February. Enck, who headed up a staff of 800 and a budget of $700 million under President Obama, certainly has enough familiarity with environmental issues to draw such a conclusion. Since leaving the position shortly after Trump’s inauguration, she’s been commended for her vibrant Twitter presence and her work around the industrial contaminant perfluorooctanoic acid, or PFOA. “Grassroots groups are most often female, and you can’t say this is because women have more time on their hands, because they’re usually either working full time or are busy raising children,” Enck asserted. I brought up something I’d read in an interview with Lois Gibbs, the pioneering environmental health advocate (and incidentally a good friend of Enck’s) who brought the toxic waste site at Love Canal to the nation’s attention in 1978. Most of the women who worked as activists around Love Canal ended up leaving their husbands, who couldn’t come to terms with their wives’ radicalizations. Enck reflected on the deeper issue this points to: women’s activism is seen as conflicting with domestic obligations. It’s a tension environmental advocates have grappled with for years. Critics used gendered language to discredit Rachel Carson, author of Silent Spring, the book that touched off the environmental health movement. Wherever we look, women seem to take up the helm in promoting environmental well-being for their communities: Lois Gibbs and her posse of housewives at Love Canal; the Chicano Mothers of East Los Angeles, who shut down plans for an incinerator in 1987 with their activism around environmental justice; the New Orleans Bucket Brigade, who track toxic air pollution from petrochemical processing in Louisiana. And, more recently, the residents of Hoosick Falls, NY, and Bennington, VT, who fight against Saint-Gobain, the corporation responsible for polluting their groundwater with PFOA – a by-product of Teflon manufacturing linked to a number of serious diseases, and detected far beyond the EPA advisory limit in the Bennington College area. Back in 2015, Enck made the call publicly for Hoosick Falls residents to stop drinking the village’s water, after several months of New York State officials trying to keep news of contamination under wraps. A similar panic gripped Bennington and North Bennington (where a Saint-Gobain factory operated up until 2002) soon after. Since then, local residents have banded together to ensure everyone’s drinking clean water, and to hold the polluting company accountable – and this work has been done, in large part, by mothers. This question has enthralled me and guided much of my inquiry into the public response to PFOA. I’ll start here, with an anecdote of my own. This past fall, as I was hitting what felt like a lag in my research, I stumbled across something. It was the profile picture for a Facebook community group called “PFOA in our water,” where members share articles and updates about PFOA. 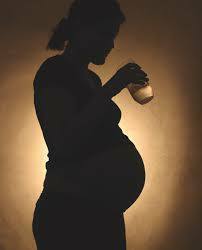 The picture, which I look back at often, is the silhouette of a pregnant woman with a glass of water in one hand. Not only was I struck by this choice of a poster child (or “poster mother,” if you will), but also the way she poses in this image. The light emanating from behind her pregnant belly darkens her body, her features ominously unavailable to the viewer save for their outline; but she is also haloed in light, a Madonna-esque touch that seems to hold her sacred. She looks down at the glass, perhaps reticent, but still, about to drink from it: repulsed by and bound to her own toxification. In line with many politicians before her, she emphasizes pregnant women and their accompanying fetuses as the most vulnerable party. Toxics intervene in the task of reproduction by rendering both men and women infertile and by causing birth defects, early childhood illnesses, and complications with pregnancy. Of course, these things only happen in a proportion of cases, even in locations where toxic exposure is ubiquitous. But chemicals like PFOA introduce a new layer of uncertainty to all aspects of childbearing, heightening anxieties about whether a child will be healthy, and in what ways it might not be. One community member I spoke with told me her daughter had considered terminating a pregnancy after news of PFOA contamination broke, nervous that her new baby might suffer from the same (or worse) health maladies as her older children. Beyond the question of whether to get pregnant or keep the pregnancy comes the question of whether or not to breastfeed (the one pregnant woman I interviewed and the pregnant daughter of the interviewee I just mentioned both opted not to). Breastfeeding presents a uniquely effective way for mothers to clear PFOA and toxins from their own bodies; the flipside, of course, is that they’re feeding it into the mouths of their infants. Breastfeeding is such a must in modern medicine – indeed, “mother’s milk” is treated as a stand-in for maternal love itself – that doctors, at least the ones this woman was consulting, seem unwilling to think with how toxic events could have altered the act’s net benefit. The risk to her child becomes increasingly individualized, as though she alone bears the responsibility of substantiating and mitigating it. What ought to have ended with a corporate imperative not to spew chemicals into the water without full knowledge of their human health impacts funnels into a present, individualized decision about whether or not to breastfeed. Beyond what’s imposed by biology, there are experiences initiated by the labor and caretaking mothers generally carry out that dictate their relationships to toxins. It’s estimated that women, many of them mothers, provide 80% of the world’s healthcare, attributing them a material, experiential knowledge of how toxins impact the body. Lois Gibbs, in fact, credits her day-to-day maternal activities (bathing and feeding her children, taking them to their doctor’s appointments) with the realization that something in her neighborhood was chemically amiss. In our area, too, concern about PFOA often stems from the caretaking responsibilities taken on by women. Marpe’s involvement led her to make a run for a seat on the Hoosick Falls Village Board this past March. Although she didn’t win the position, her run punctuates her journey from apoliticality to vocal participation. Like environmental activists before them, many women in the Bennington area have found their roles as mothers and caretakers suddenly politicized by the revelation that there’s a dangerous contaminant in the groundwater. But, unlike the previous generation of activists who relied on newspapers and television cameras to get the word out, these activists have a more modern toolbox. They’ve taken to social media to make their voices heard. Loreen Hackett, a lifelong resident of Hoosick Falls, has been plagued by mysterious illnesses since she was a teenager. Now in her fifties, she’s helping to wage a war against the companies responsible for polluting the groundwater, not for her own sake, but for her grandchildrens’. The Twitter account she began about two years ago, pfoaprojectny, features pictures of her grandson and granddaughter holding up signs that list their PFOA blood levels, both of which are nearly 20 times what’s considered a “background” level in the human bloodstream. The photos hit a nerve, sending Hackett before the New York State Assembly to testify back in 2016. Rather than taking offense at the gendered stereotypes that opponents throw at them, women like Hackett have opted to work with this language. Michele Baker, who runs the New York Water Project and has been heavily involved as an organizer on the PFOA issue, invites descriptions like these for herself and her fellow activists. (From left to right) Activist Michele Baker, former EPA Regional Administrator Judith Enck, and New York gubernatorial candidate Cynthia Nixon at a recent press conference in North Hoosick. “We’re the crazy moms on Twitter,” Baker said at one point, in conversation with Judith Enck back in March before Enck’s Bennington College lecture. She and “the gals” – the other mothers she works with as part of the New York Water Project, an advocacy group – used their social media presence to harangue Governor Cuomo into signing a bill into law in July of 2016, one that extends the statute of limitations within which a person can claim personal injury due to toxic exposure from a Superfund site. At one point, a group of mothers from Flint, MI, came here to meet with the New York Water Project, the two factions expressing solidarity with one another. “We feel so humbled that they came out,” Baker stated. Now more than two years into the realization of crisis, both Hoosick Falls and Bennington are working towards getting Saint-Gobain to pay up for their damages and the resulting infrastructure and medical testing the towns have provided. Long-term, the hope is that this event will result in legislation that keeps industry on a tighter leash when it comes to the pollutants they release into the environment.